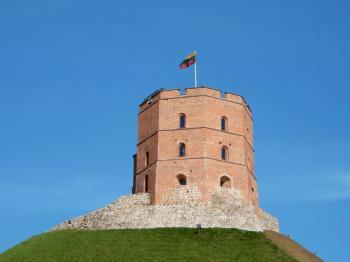 The Lithuanian capital Vilnius is a historic trading town with medieval origins. 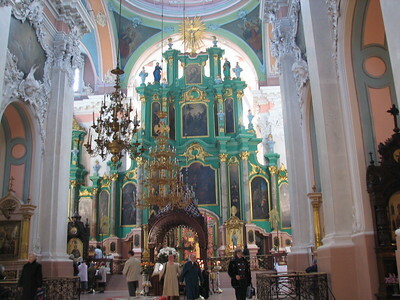 It is situated right on the boundary between Catholicism and Russian Orthodoxy. It also holds a variety of other religions, like that of the Karaites, Jews and Muslims. The historic buildings are built in the Gothic, Renaissance, Baroque and Classical styles. Vilnius is a great find. 'The new Prague', some say. The ICOMOS report mentions Cracow. Having visited them all by now, I do believe that Vilnius is in the same league as Prague and Cracow - the quintessential Central European towns. 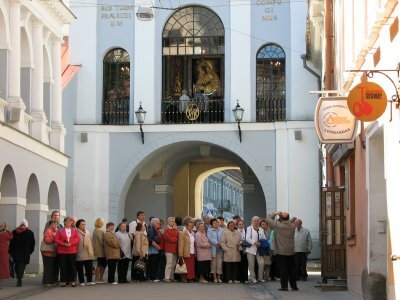 Our best memory was visiting the Russian Orthodox Church of the Holy Spirit early in the morning, and watching 50 – 60 people go about their rituals. The all-brick St. Anne’s church gets the votes for the most impressive exterior. Another benefit of the town is that, despite having about 600.000 inhabitants, it still is very pleasant: clean, easy to be explored on foot, many restaurants, parks, places to sit, most buildings in good repair. Almost everything looks new - restorations have almost finished, in time for early 2009 when Vilnius will be the new Cultural Capital of Europe. The ‘Why’ isn’t explained very well in the ICOMOS report that got Vilnius the WHS status. A visiting professor highlighted its ‘rich collection of buildings from different ages and full of everyday life’. This may not sound very special, but does justice to the combination of a rather unique religious atmosphere and variety in building styles in this town. A visit is well recommended, you'll need at least two days (preferably more). Even though it doesn't have any standout attractions, Vilnius is a very pretty and clean city with a well-preserved old town and a large number of historic buildings. The many Renaissance and Baroque buildings and Catholic churches make it seem like a classic Central European city similar to Krakow, rather than a Nordic, Protestant city like Tallinn. The best-known landmark is the tower of Gediminas Castle on a hill in the Old Town, followed by a cathedral that looks like a Greek temple, and the beautiful St. Anne's Church. I also enjoyed a visit to the interesting National Museum, housed in the Palace of the Grand Dukes of Lithuania. Holy Spirit Orthodox Church with the peculiar green altar (free entrance). The UNESCO plaque is just next to the town hall columns. All in all I spent 3 days in Vilnius (including half day trips to Kernave and Trakai Castle) and having visited all 3 Baltic capitals, I would say Vilnius is the least interesting of the three and in my opinion the only Baltic capital which is not the true highlight of the country. Still it's a pleasant city for a cheap weekend trip. The Vilnius old town gives the impression of a small town somewhere far in the province, and I find that as no disadvantage. The whole district is quiet but offers a lot of beautiful religious buildings of all architectural styles. If you feel fatigue and hunger, you can find very easily a place with cheap and tasty local specialties to try. A big thumbs up from me for Vilnius. Whilst the main sights are nice they are not astounding however the city has a great atmosphere and wandering aimlessly around the old town’s cobbled streets was an exceptionally rewarding way to spend a weekend. 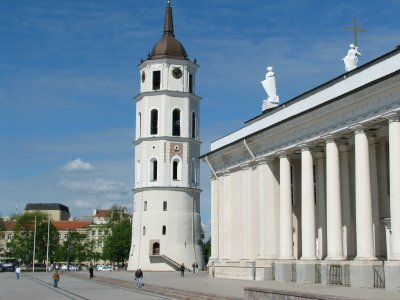 I spent three days in Vilnius in February 2010 using it as a base to explore south-eastern Lithuania and it was great. It reminded me an awful lot of the Czech city of Olomouc, where I studied a few years previously, and for me that is a big complement. I really enjoyed just walking through the winding lanes discovering bars, cafes and quite a number of churches. It was also good to see the University was a core part of the old town and the students sauntering to and from classes brought a relaxed air to the place. They also made the nightlife very enjoyable Cozy, Prie Universiteto and Bûsi Treèias were the drinking establishments I enjoyed most. Whilst walking between bars I also got to hear some of the incredible folk singing that the Baltic States are so famous for. It was very different to the sort of post-pub singing you hear in Britain, four part harmonies instead of a drawl about a favourite football team. The main sights of the city were nice, especially St Anne’s church and the Gates of Dawn. The two big squares, by the town hall and the cathedral felt a little too open and ordinary in comparison to the surrounding streets. However the view from the Higher Castle and the Artillery Bastion were particularly pleasant. It does all manage to squeeze in a Micronation in the shape of the Uþupis Republic).). For some reason there is something in Vilnius that reminds me of Copenhagen. It might be the relaxed atmosphere or the obvious resemblance between the bohemian district of Uzipio and its Danish cousin Christiania. A slow walk around Vilnius Old Town and you will constantly bump into a mix of churches, monasteries, old Jewish areas, restaurants, cafés, hotels and small houses on the verge of collapse. On my first visit to Vilnius in 2002, I was amazed by the number of excellent restaurants I found and on my return, four years later, there seems to be even more of them around. In difference to its two Baltic capital cousins, Tallinn and Riga, Vilnius is the town of unlimited “bon vivant”, something that’s for sure been discovered by an increasing stream of summer tourists. But in my opinion, Vilnius can be even better on a chilly autumn day when walking almost alone in the lovely parks that surround Gediminas Hill. On the hill once stood two 14th century defence castle but today there is only one castle of them left together with a tower. But just below the hill, the Lithuanians are rebuilding their main castle that was burnt to the ground in the late 18th century. They are likely the only nation in the world to be building a fully-fledged castle in the absolute centre of their capital – five points for that! One of the absolute-must-places to visit in Vilnius is the 16th century Church of St.Anne, a gothic brick-construction that once Napoleon, invading his way into Russia, was absolutely flabbergasted by. And if you for some reason get tiered of Vilnius, why not hop on one of the many excursions tours to the town and castle of Trakai. It’s just 40 km south-west of the city and you suddenly you find yourself in the midst of a nature park with lovely lakes and a brilliant brick castle that easily could have been taken out of a movie. My three favorite European cities are Tallinn, Krakow, and Vilnius. Like the other two, Vilnius has a picturesque old town that's not too commercial and touristy like Prague, yet isn't sleepy like Toledo. These three are just right--bustling little city-towns that haven't sold out their cultural identities. All three beg you to simply wander the cobblestone streets in an attempt to get lost. Though choosing one is a toss-up in terms of UNESCO criteria and prices, I give a slight edge to Vilnius for its nightlife and its location. In one direction, the insular castle of Trakai is 20 km away, as is the geographic center of Europe in another. Within an overnight train-trip or less, you can reach numerous World Heritage Sites in Lithuania, Poland, Russia, Belarus, Latvia, and Estonia. Another advantage Vilnius holds: it has a strong sense of its various historical periods. The hilltop castle has watched over the city for centuries; the genocide museum remembers the decades watched over by the KGB. Visit the church Napolean wanted to take home with him, or touch the cement blocks that protected democracy-minded Parliamentarians from Soviet tanks on the night thirteen citizens were massacred in 1991. The longer you stay, the more you'll discover. Prison: The Domenican Monastery used to serve as a prison. Napoleon was here: Conquered by Napoleon on his way to Moscow in 1812. Said to have liked the St. Anna Cathedral so 'that he wanted to take it home in the palm of his hand to Paris'. Introduction of Christianity: The Cathedral . "Lithuania was the last great pagan state in eastern Europe to be converted to Christianity, in 1387 when Grand Duke Jagaila was baptized" (at Wavel Cathedral Cracow as a prerequisite to marrying the King of Poland's daughter and becoming King himself). 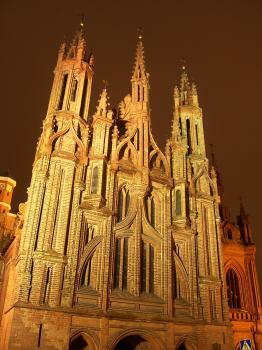 "The Lithuanian King Mindaugas (had) built the original cathedral in 1251 after his conversion to Christianity. Remains of the archaic quadratic church with three naves and massive buttresses have been discovered beneath the later layers in the late 20th century. After Mindaugas' death in 1263, it again became a place of pagan worship. 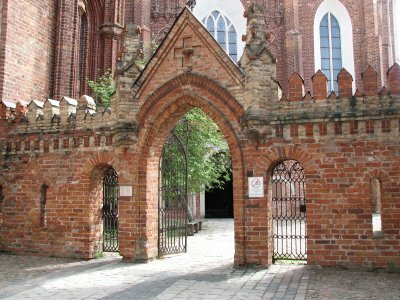 In 1387, the year in which Lithuania was officially converted , a second ... Cathedral with five chapels was built" (later burnt down and again rebuilt) .